The Theatre of Dionysus Eleuthereus is a major theatre in Athens, built at the foot of the Athenian Acropolis. Dedicated to Dionysus, the god of plays and wine (among other things), the theatre could seat as many as 17,000 people with excellent acoustics, making it an ideal location for ancient Athens' biggest theatrical celebration, the Dionysia. It was the first stone theatre ever built, cut into the southern cliff face of the Acropolis, and supposedly birthplace of Greek tragedy. The remains of a restored and redesigned Roman version can still be seen at the site today. It is sometimes confused with the later, smaller and better-preserved Odeon of Herodes Atticus, located nearby on the southwest slope of the Acropolis. The site was used as a theatre since the sixth century BC. The existing structure dates back to the fourth century BC but had many other later remodellings. 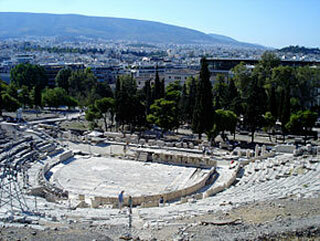 On November 24, 2009 the Greek government announced that they would partially restore the Theatre of Dionysus. This article uses material from the Wikipedia article "Theatre of Dionysus", which is released under the Creative Commons Attribution-Share-Alike 3.0 License.